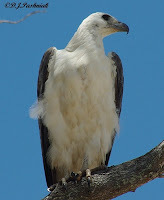 The other day at Inskip Point I watched the White-breasted Sea-Eagle in action. It was sitting in a tree at the edge of the sand when I first saw it. I took my eyes off it for one moment to look more carefully at the puddles I was crossing and when I looked back it was gone. Then I saw that it had swooped down into a near-by stretch of deeper water and caught a fish. 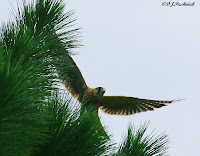 It then flew back into the trees to eat. I walked slowly up to the trees and looked back to where the eagle had caught the fish. It was several hundred meters away and looking into the sun. The water to my eyes was just a glittering surface of silver. What amazing eye-sight these birds have! I walked slowly up under the trees where the eagle was eating the fish and it took no notice of me. It looked up every now and again but its attention was focused on the sky around it rather than the ground where I stood. 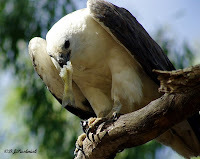 It took some time to eat the fish and appeared to tear off quite small pieces at a time. When it had finished it flew off through the trees and out to the open water in the channel. Yes! Finally! After five years I have been lucky! I was walking down the bush track at Inskip Point yesterday afternoon and a little bird walked quickly across in front of me. This part of the track was shaded and I had just been photographing birds up against the light so I had the wrong camera settings - but no matter. Point and shoot! And I was lucky! I don't think it had seen me until it was across but it must have warned the other three in the group because they scooted across so fast that all the rest of the photos were blurred. However, I will post one of these blurred ones because the colors show slightly differently. Here's hoping that I have another try and get better photos next time! The Eastern Curlew (Numenius madagascariensis) is the largest of our migratory waders. It's easy to identify but not easy to get close to. Since I bought a DSLR a few months ago I have really been enjoying the way I can now take photos of birds in flight. There is so much beautiful color and pattern to see on the spread wings. 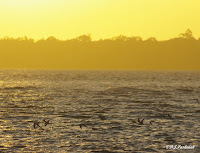 Yesterday afternoon I went out to Inskip Point in the late afternoon. A walk through the bush track leading out to the Point is always interesting and this time I got good clear views and photos of White-cheeked Honeyeaters. I find photos interesting because they freeze the bird in poses often very different from the stiff side views found in most birding books. These photos show the white cheeks quite differently from anything in my books. We had been told that other birders had seen a Kelp Gull here a few days ago. This is a very rare vagrant up here and we hoped that maybe it had stayed around for a few days. We were lucky! I was intent on a large flock of little shorebirds that kept flying in and roosting in the car tracks out on the point but fortunately 'Neil' from Out and About in Cooloola wandered a bit further on and then beckoned to me to come quickly. The gull was sitting quietly at the edge of the sea - and what was even better it let us walk quite close to get some good photos. It only flew off when a couple of people with a dog running loose came walking along between us and the bird! The Tern count we did as the sun set and darkness came down was not nearly so interesting. Last time we were out here (2 and a half weeks ago) we counted a little less than 7,000 terns. This time there were less than 2,000. Where had they gone and why? The sky is always beautiful looking out across the water and this evening it was particularly spectacular as we watched very dark storm clouds moving from east to west some distance south from us. I went out to Inskip Point yesterday and walked through the bush track out to the end of the point. There were the usual interesting numbers of birds there - including a good view of 3 or 4 Black-breasted Button-quail. Like all quail they are great at hiding in even the smallest clump of grass and I was not fast enough with the camera to get any good photos. When I came out to the sand area at the end of the track I could hear a bird calling from somewhere out ahead of me. It took me a few minutes to spot 3 Beach Stone-curlews taking cover underneath a large tree stump that has come in on the recent high tides. I had seen photos taken a few weeks ago of a juvenile with the resident pair. 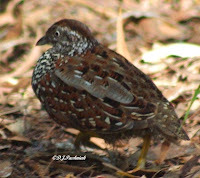 I was not sure until I got home and put the photos up on the computer if the plumage would still identify the juvenile, but it is still clearly evident. 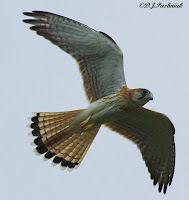 I can't find any reference in my books telling me how long the juveniles retain this distinctive plumage. I took the photos I wanted and moved back without disturbing the birds too far from the tree stump. I walked around out there for a little while and when I went back towards the bush the birds had still not moved from the tree stump although they were still calling. 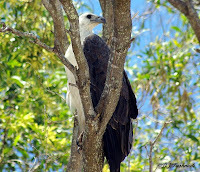 When I looked up into the trees at the edge of the sand this White-breasted Sea-Eagle was sitting and watching. It was not at all worried about me walking around underneath and let me get right under the tree to take photos. 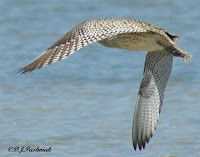 Was this why the curlews were sheltering under the tree stump out on the sand? I would have thought they would be too large for the eagle to touch but I know that lots of shorebirds will disturb as soon as the shadow of a raptor passes over them - regardless of what the raptor may be. I went for a very slow and careful walk yesterday morning out to the Mullens creek roost site. My dog Misty dances all around me when she knows that she is going in the car with me. When I let her into the car she curls up on the floor until she feels the bumpy corrugated surface of the road over the last few hundred yards down to the bay. Then she is alert and excited again and can't wait to run off and explore all the smells where other dogs have walked. Yesterday morning was a bit different. She apparently didn't think I should be walking around. She walked close behind me and kept touching my sore knee with her nose. I don't know how she knows these things. Maybe she can smell or feel the heat in the knee? Anyway it was quite a while before she decided that I was walking so slowly she could go off and explore the shoreline and still keep a careful eye on me. It was low tide so I didn't get close to any birds on the roost site. They tend to roost on the far side and the only way to get there is in the kayak. This is a huge area of saltmarsh. None of the vegetation is more than a few inches high. It always looks dry and burnt-up – possibly because most of the plants are red colored and the ground is covered with a dark wrinkled crust of algae. Its only when you look very closely that you start to see seasonal changes in all the tiny plants. Yesterday, for the first time, I saw tiny seed heads on the grass. All the plants out here flower and set seed very quickly and you can miss seeing any of it by only a few days. Seablite (Suaeda australis) which I have seen in flower nearly every year. I think it may have a slightly longer flowering period. I am posting a photo of a Bar-shouldered Dove (Geopelia humeralis) which I photographed at Inskip Point a while ago. 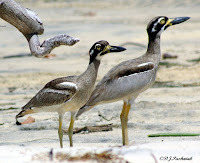 I frequently see these birds in this environment - both in the bush and also down at the edge of the sand. 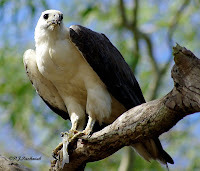 For more bird photographs see the Bird Photography Weekly. As the photos on the previous post show it was a very pleasant evening at Inskip. However, we were there to count shorebirds first and then terns as the evening progressed. There are always large numbers at Inskip and this time was no different. There were over 2000 shorebirds with all the expected species there. However, for next time it will be better to count earlier in the afternoon as the evening light from the west made ID difficult. Of course the ideal way to count shorebirds at this roost is to kayak out to the sandbank but an accident to my knee a week or so ago has made kayaking impossible for the present. Even walking is a challenge! Observing and counting the terns was great. I saw the first juvenile Crested Terns of the season. I also saw Little Terns going in to breeding plumage. These Little Terns are from the northern race that breeds up in Asia. The one in the photo below has already changed the color on the bill. Counting the terns is an exciting and challenging occupation. As yet there is no long term data for terns on roosts such as Inskip Point and we really know very little about the habits of migratory terns while they are down here in Australia. Jill Dening has data from the Caloundra sand banks over a number of years and the numbers down there show that it is a most significant roost for migratory terns. Jill and her group are also collecting similar data for the Noosa River roost. But very little is known about the tern roost at Inskip. Jill was here with us to count and teach the rest of us some of her techniques. As evening came on we first counted the terns which were already roosting out on the sand bank. Then we stood with eyes glued to the channel between Inskip and Fraser Island to count groups of terns as they came in from their feeding grounds out at sea. We were rather fortunate as the terns were only coming in that way. On previous counts last season they also flew across the narrowest point of land and came in across Pelican Bay. This needed two sets of counters standing back to back to see the arriving birds from the two different directions. In the earlier part of the evening the birds are clear against the sky but as it gets darker they fly in closer to the sea and become much harder to see. This evening they mostly arrived in groups of 20 to 60 birds. I noticed Jill clicking over her counter and recording 50 at a time. I can now see a difference in the Crested Terns and migratory terns (Common, Little, and White-winged Black) as they fly in but it will be a long time yet before I am quick enough at this recognition to count them this way as they fly in. We counted in excess of 6,700 terns. I have left these next pictures very large when you click on them to give a better idea of what we were counting. Early evening and the terns on the sand island kept disturbing and flying up then settling down again. A sky full of terns disturbing from the sand island - one of our number suggested they look like a swarm of mosquitoes! Terns flying in down the channel - still easy to see in the glow of the setting sun but more and more difficult as the light gets dimmer. Inskip Point in the Evening. Late yesterday afternoon I joined a group at Inskip to observe and count shorebirds and later terns. Even without any birds to watch, sitting on the sandbank and watching the sun and the water is enjoyable. I'll post about the birds tomorrow after I have a chance to sort through the photos - but for now these are just to remind everyone how beautiful early evening is at the sea-side. A White-breasted Sea-eagle flew over several times - this picture shows the white feathers catching the colors of the setting sun. The blue slowly darkened in the sky and the sunset colors brightened. 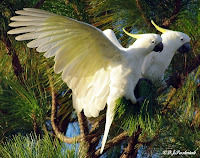 Nearly every day Sulphur-crested Cockatoos spend some time in the big pine tree next door. Sometimes they only settle briefly but when the pine cones are the way they like them then they sit in the branches and pick off cones one at a time and chew them open to get to the seeds. These birds are not my favorites as they also have a nasty habit of demolishing any fruit they find on my fruit trees - and then screech noisily when I chase them off! I have just been sitting out on my back veranda enjoying a morning 'cuppa'. The Kestrels flew by and apparently disturbed a number of Sulphur-crested Cockatoos that were in the pine tree next door. One kestrel than proceeded to lead the cockatoos on a little game of chase. 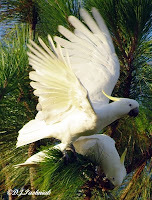 It flew just ahead of them swooping around the pine tree out and up and around again with four cockatoos in pursuit. It was definitely NOT flying at normal Kestrel speed but was just keeping a few meters ahead. This continued for just long enough for me to step inside and get the camera and take a few quick photos. Unfortunately, I was not quick enough to get the cockatoos and the kestrel in the same photo. 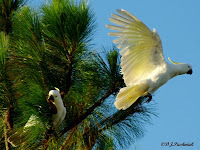 The cockatoos got tired of the game first and settled down in the pine tree again while the kestrel then flew off at a quite different speed. Was this one of the juvenile kestrels having fun? 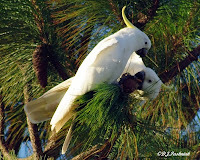 None of the birds seemed distressed at all and the cockies were not even screeching. Nice to have a few bird antics to enliven the morning 'cuppa'.